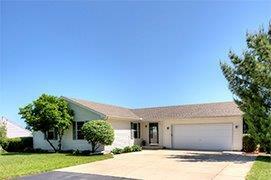 Welcome home to this move in condition ranch with a large deck. The spacious deck overlooks a tree lined back yard. Set on one acre, you will not be able to resist this ranch with an open floor plan. The living room, dining area and kitchen all flow from one to another and have access to the large deck from two different sets sliding doors. 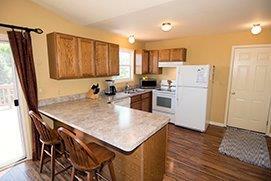 The kitchen has plenty of cabinets and an breakfast bar open to the dining area. The generous dining area is open to the living room. All three spaces share a vaulted ceiling and smart laminate flooring. The master bedroom has it’s own bathroom, and the two additional bedrooms are very nice. All feature ceiling fans, window blinds and richly colored laminate flooring. The walkout lower level doubles the space and functionality of this home. The lower level is completely finished, includes built-in storage, lots of closets and a study. This home has many of updates including: carpeting and flooring (2010), roof (2012), water softener (2012), water softener (2012) and kitchen countertops (2014). This darling ranch is close to the Village of Pinckney and Hell. You can enjoy Chelsea and Dexter, only 15 minutes away. 5 more and you can be in Ann Arbor! If you don’t add this Porpertunity to your list of Ann Arbor Real Estate favorites soon, you may be kicking yourself.